You can opt-out of any optional student activity fees here. Exemptions: Students 65 years or older, students registered exclusively in correspondence, off-campus or evening courses. 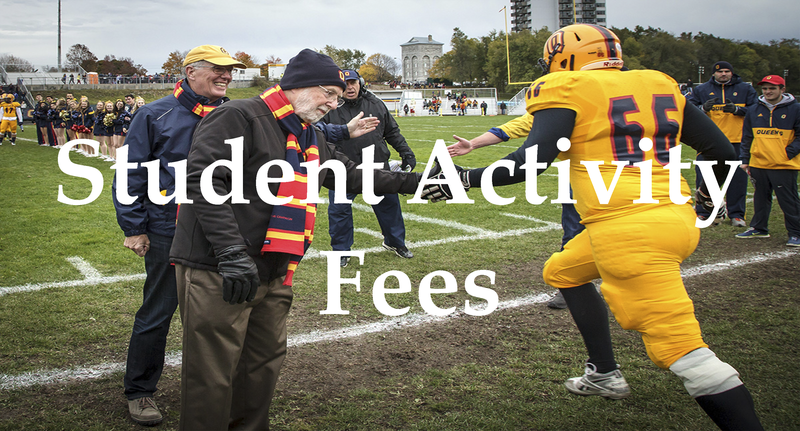 Students registered in 9 or more units (equivalent of 3 courses) and attending Queen’s University are assessed full student activity fees; both mandatory and optional. This assessment is done in the Fall. Students enrolled solely during the winter term are assessed 50% of mandatory student fees. Undergraduate students who would not normally be charged student activity fees may opt-in at 125 Gordon Hall if they wish to participate in and have access to undergraduate student government activities and services. How Are Student Activity Fees Established? Virtually all student activity fees are established by majority votes in campus-wide referenda. In order for a fee to appear on a referendum ballot it must collect signatures in support from 2% of AMS members and/or be approved for the ballot by the elected legislative branch of the student government (AMS Assembly). Most student activity fees are subject to review by referendum every three years, giving students an opportunity to either confirm or reject support for individual fees. Any student wishing to opt-out of any optional AMS or Faculty-Specific Fee, with the exception of the AMS Health and Dental Plans may do so on-line from Tuesday, September 4th until Monday, October 1st. Click here to opt out of optional student fees.. Please note: tuition is due September 30th, but student activity fees are not due until October 1st. Your SOLUS account should show Future and Current Due amounts. If you have not paid for your student activity fees by September 1st, this should not affect student card validation or participation in open enrollment. Students who formally complete their degree program or withdraw from the University must submit their student card to the Office of the University Registrar, Gordon Hall, Room 125 in order to obtain a refund of student activity fees. The AMS has established a bursary to assist a limited number of students facing significant financial need in paying for their student activity fees. Students can apply for the bursary through the General bursary application available on SOLUS. There will not be a separate application. These are due by October 31st. If you have any questions or concerns about this bursary, please contact the Vice-President (University Affairs).